To become a successful blogger or an online businessman, you need high-quality backlinks to the site. We know several ways to create backlinks like guest posts, blog comments, bookmarking sites and paid posts. Wikipedia is another prominent but less known option for link building. We often refer to it for various clarifications or to get accurate information on a certain topic. It is the most reliable and largest knowledge base on the web. So a Dofollow link from Wikipedia will be more valuable and will help your site a lot. How can you get a link from a Wikipedia page? As you know, Wikipedia is a free encyclopedia where anyone can contribute articles on everything around the world. If your site has genuine posts, probably someone may link their article to your post. Otherwise, you are free to do it. Initially, you have to register for a user account in Wikipedia, which is essential for writing, editing on the site. Then, you have to find out whichever pages currently need citations or have broken links. Wikigrabber will help you to find out such pages. 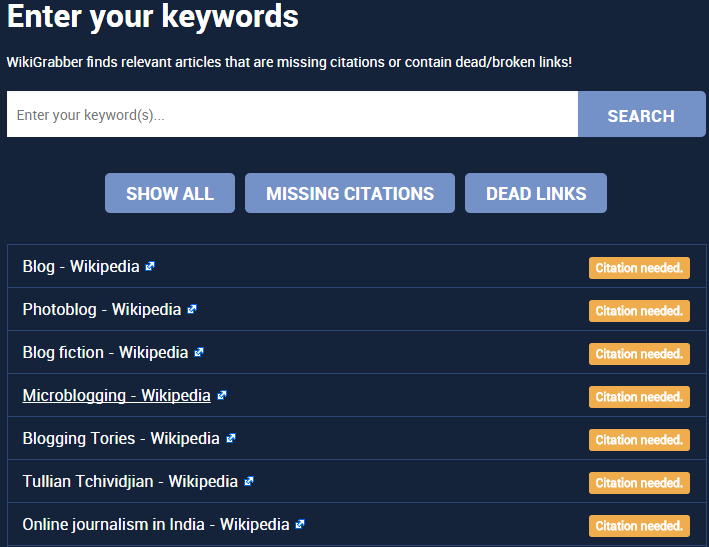 Enter your keywords in the search box, to get relevant Wiki pages. For instance, if you are running a blogging tips blog, enter ‘blogging’ or ‘WordPress’ there and it will show a couple of pages from where you will get backlinks. Check what type of rectification it needs. Go to the desired page, choose Edit option near to the page title or section, according to nature your work. Do the necessary modifications, fix broken links if any in this stage. Finally, click on save option. It may take some time to verify your work. Be patient, until they approve at least 4-5 of your works. After that, you are free to insert links on your niche articles.